A black and white negative of a garden. View is of the side of the garden. The negative envelope refers to the negative as the Cormack Garden. 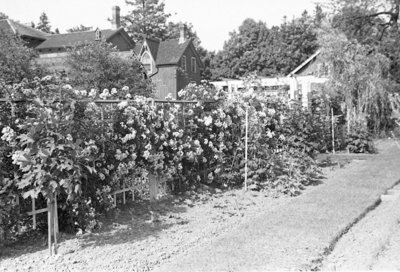 Mary Esther Cormack's (nee Pringle) garden was located at 241 Dundas Street East. Cormack Garden, July 1937, Marjorie Ruddy. Whitby Archives A2013_040_030D.